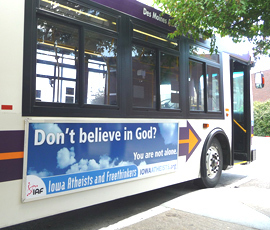 The group Iowa Atheists and Freethinkers (IAF) has launched an advertising campaign on the sides of 20 transit buses in Des Moines. The ad features an image of a blue sky with clouds and the words "Don’t Believe in God? You are not alone." I-A-F spokesperson Lily Kryuchkov says the purpose of the ads is to simply raise awareness of the group’s existence. "A lot of times nonreligious people feel isolated and with all the negative attitudes toward atheism, they don’t have anybody to talk to," Kryuchkov said. "So, we’re trying to provide a community for them." I-A-F formed one year ago in Des Moines and has grown to around 120 members. Kryuchkov says the nonprofit group’s primary focus is social networking and education. "We’re not really forceful and not trying to convert anybody, but kind of in a friendly way, letting people know there’s an alternative view that exists here in town. But, we’re not real aggressive about it," Kryuchkov said. I-A-F members marched in the Capital City Pride Parade this summer and the organization has a booth at the Des Moines Downtown Farmers Market. Kryuchkov says they chose August to run the ads because of the timing with the Iowa State Fair. "We know there will be a lot of visitors to Des Moines from all around the state. So, we’re hoping that we’ll be able to reach many more people during this time as opposed to any other time of the year and let them know we are here," Kryuchkov said. The ads were prepared by a national nonprofit organization called United Coalition of Reason.